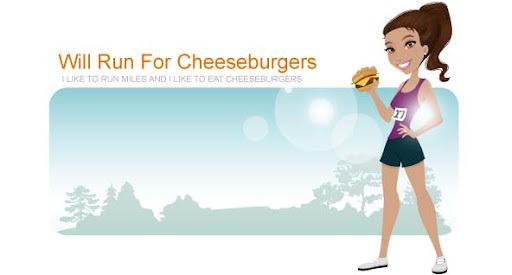 Will Run for Cheeseburgers: 6 weeks to go! Things get pretty real when you realize your half marathon is 6 weeks away. My longest run has been 8 miles which means I need to find the motivation to run another 5.1 miles. I'm planning on doing 9 miles this weekend and even enlisted Ryan to buy me a couple of Gu's to use as fuel. I hadn't been using a training plan but just googled a couple of different ones and think I'll try to follow Hal Higdon's novice 2 training plan for the remainder. Since I'm doing a 5k on 8/29, I'll just swap weeks 6 and 7. I like this plan because there are 4 days of running, along with 1 day of cross-training, and 2 days off. With such an increase in mileage I'll definitely need those rest days to avoid injury. I ran 4.2 miles on Sunday, 3 miles on Tuesday, and 3.1 miles yesterday. I took today off and will probably try to run tomorrow or take a class at the Bar Method. Looks like I'm right on track! As the weeks tick by I'll put more thought into my goal finish time for the race.